It’s World Asteroid Day today so it wouldn’t be right to talk about anything other than asteroid impacts and their potential for the total annihilation of the human race. Asteroids come into contact with the Earth at a rate of around 25 per year but the majority are small enough that they burn up in the atmosphere. A few however are large enough to make it through to cause an impact or an explosion and these are the space rocks that stand a pretty good chance of wiping us out one day. You might remember the Chelyabinsk meteor as the asteroid that exploded over Russia in February 2013. The meteor burned with a light that was brighter than the sun, even at a distance of over 100km away when it exploded with a force equivalent to around 30 times the energy of the atomic bomb dropped in Hiroshima. What made the Chelyabinsk meteor remarkable was that it was the first major impact event to occur in the social media age and the only event that is known to have caused casualties. Over 1,500 people needed hospital treatment for cuts and bruises as windows in the local area were blown out. The meteor was first spotted by a satellite as it entered the atmosphere but was soon visible to the naked eye as a bright object trailing smoke before exploding in an air bust at around dawn local time. The explosion caused a blast wave that damaged structures in the local area (estimates put the damage caused in the region of around US$33 million) – mostly windows that were shattered by the shockwave. The Chelyabinsk meteor made the world sit up and take notice and prompted calls to put a space defence system in place to protect against rogue asteroids. The devastation caused by this relatively small meteor in a relatively sparsely populated location only goes to show the damage that could be done by a larger asteroid or if it had impacted in an urban area. Unfortunately, at this point in time there is no system in place to defend against asteroids and no plans to implement one (although the founders of Asteroid Day, including Queen guitarist and Astrophysicist, Brian May created the awareness day with the intention of drumming up investment in this area). The Tunguska event is the asteroid that really captured the imagination of the global public. The event occurred in in Jun 1908 but even in the 21st century it is still a popular cultural touchstone and provides subject matter for numerous TV shows, movies and video games (including my personal favourite – the X-Files). The actual event took place in southern Siberia on 30 June 1908 and like Chelyabinsk was an air burst event rather than an actual impact. The shock wave from the Tunguska event was strong enough to flatten forests and knock people from their feet hundreds of kilometers from the impact. The event had caused an area of forest of around 2,150 square kilometres to be scorched and blackened with a smaller area of around 200 square kilometres where the trees had been flattened completely. Due to the isolation of the region, it was over a decade before the event was formally investigated but even then the devastation was still apparent. One of the most unusual aspects of the event was that aurura like after glows were recorded for several nights after the impact – something that is no doubt partly responsible for Tunguska’s constant presence in science fiction culture, particularly in relation to aliens. The Chicxulub impact is arguably the asteroid that has had the biggest impact on humanity – even though it happened around 66 million years ago. How can that be? Well it’s possible that without Chicxulub we wouldn’t be here at all. Chicxulub is theorised to be the impact event that resulted in the extinction of the dinosaurs, eventually paving the way for man to inherit the earth. 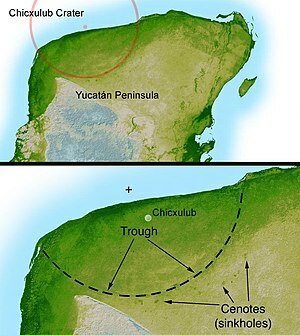 The Chicxulub crater is located on the Yucatan Peninsula in Mexico and is was formed by the largest known asteroid impact in the history of the planet. The crater is more than 180 kilometres across and 20 km deep. The part of the asteroid that caused the crater (the bolide) is estimated to have been at least 10km in diameter. The crater is so large and so old that it was not discovered until the early 1970’s as it is covered by layers of rock that have formed on top of it later. The impact would have caused extreme effects across the globe including megatsunamis and clouds of red hot dust that would have killed anything it touched. The surface of the earth in areas would likely have boiled and turned to lava, causing wildfires to break out and shock waves would have triggered earth quakes and volcanos. Oh, and on top of that the dust thrown up would have choked the earth for the next decade, causing respiratory problems for animals and severely reducing the amount of sunlight that could have reached trees and plants for photosynthesis. And let’s not forget about the acid rain. Ultimately it’s unproven whether Chicxulub did cause the mass extinction event that wiped out the dinosaurs but it’s a widely respected scientific theory, and while we might not be here without it, the question remains as to whether we humans could survive an event like this ourselves. A major asteroid impact is a huge potential risk factor for the human race and almost certainly wiped out the creatures that ruled the planet for millions of years before we (or even mammals!) came along.